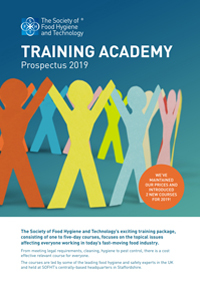 As part of its remit to share best practice in food safety and hygiene, The Society of Food Hygiene and Technology (SOFHT) has launched a programme of topical and cost effective training courses, delivered by some of the leading experts in their respective fields. The SOFHT Training Academy courses cover a diverse range of subjects, from the latest on HACCP, to pest control, managing enforcement challenges, to control of allergens and handling hazardous substances. All courses are carefully tailored to meet delegates’ level of knowledge and will update on the dominant food safety issues facing the industry today and how to manage them in a practical context.